In June of 2011, RusVinyl signed a Multifacility loans agreement for the provision of project finance to the order of 750 million Euro for a period of 12.5 years for the construction of Russia's largest integrated polyvinylchloride (PVC) production plant with the capacity to produce 330,000 tonnes a year. Financing is provided by a group of banks representing the largest global financial institutions, including Sberbank of Russia, the European Bank of Reconstruction and Development, BNP Paribas, ING Bank N.V. and HSBC. As part of the signed agreement, 150 million Euro has been made available by Sberbank of Russia and the European Bank of Reconstruction and Development each, 450 million Euro by BNP Paribas, ING Bank N.V. and HSBC, against the cover of COFACE and ONDD, the French and Belgian export credit agencies. The insurance cover provided by these export credit agencies ensures the supply of equipment, licenses and the services of RusVinyl's French and Belgian partners. 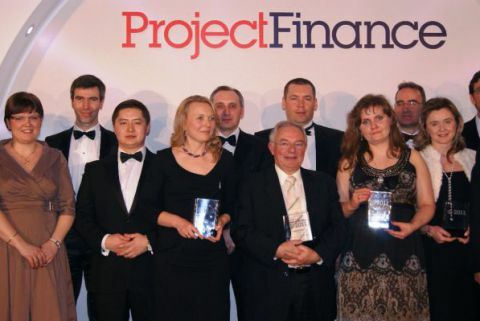 The Project Finance Magazine is one of the leading British publications in the field of project financing and is part of the Euromoney media group. Since 1999, the editorial board, with the involvement of experts, annually presents awards with respect to innovation, standardization, and overcoming challenges, risk mitigation, and speed in arranging funding for infrastructure projects.